Induration may occur after an anticancer drug extravasation in patients who recurrently receive chemotherapy because of reduced choice of an appropriate vein for inserting a peripheral intravenous catheter, resulting in catheter placement difficulty. 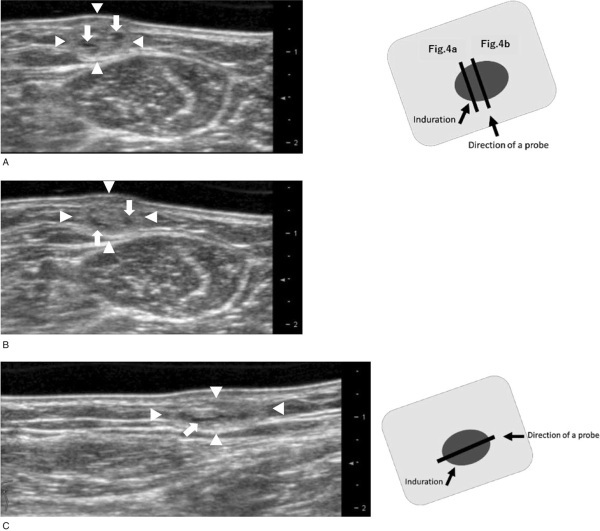 Although induration affects treatment, its size, shape, or hardness remains unclear in the conventional observation method using palpation and inspection. Here, we report our observation results in using ultrasonography to assess the induration that occurred after an anticancer drug extravasation as a new assessment method. A 58-year-old woman with cervical cancer who complained of pain during the administration of a non vesicant anticancer drug via a peripheral intravenous catheter. The medical staff's examination showed a swollen site; therefore, the catheter was replaced. Induration occurred on the site after an extravasation. Over 6 months later, pigmentation and induration, which can easily be confirmed through palpation, persisted. 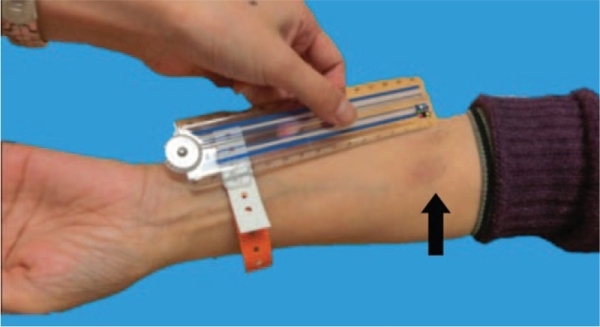 The subcutaneous tissue might have degenerated the tissues surrounding the vein, making it thinner. Moreover, the hardness of the subcutaneous tissue was approximately 7 times than that of the surrounding tissues.